McAfee Total Protection for Data Loss Prevention (DLP) safeguards intellectual property and ensures compliance by protecting sensitive data wherever it lives — on premise, in the cloud, or at the endpoints. McAfee DLP is delivered through low-maintenance appliances (physical or virtual) and McAfee ePolicy Orchestrator (ePO) platform, for streamlined deployment, management, updates, and reports. Time-to-value deployment — Unique, non-invasive Capture technology enables organizations to build and deploy DLP policies faster and more accurately without guesswork or trial and error. Simplified policy management — Flexible file tagging helps organizations set up time-saving policies based on location and application types. Data Classification technology categorizes large amounts of data so only relevant files are examined and remediated. Proactive data protection — The only DLP solution that keeps a record of all data leaving the network egress points — giving you visibility into how your sensitive information is being used. It enables you to identify and fix existing broken business processes therefore reducing risk of breach in the future. As regulations and corporate standards place increasing demands on IT to ensure safe data handling, deploying necessary protective solutions can seem daunting. Some data loss prevention (DLP) products require substantial effort to deploy and typically have large ongoing consulting costs. These products leave it up to IT to know about all the data that needs to be protected. Can IT be expected to know about all the data in the various departments of an organization and how it needs to be handled? Of course not. It’s impossible for IT to identify all of the sensitive data, interpret the regulations, and translate them into effective policies. When faced with this dilemma, many companies simply fall back to “good enough” solutions that don’t provide basic protection and offer little insight into ongoing data-related risks. At McAfee we have a better way. Built from the ground up, our DLP solution quickly and effectively protects your data wherever it may be. We make it easy to get the solution up and running by delivering it as simple components that can start analyzing your data in minutes, not months. Why waste precious time and money with frustrating solutions? There’s an easier way to resolve your data protection issues—McAfee® Total Protection™ for Data Loss Prevention (DLP). Gives you visibility on how your data is being used and how it is leaking out of your organization. Only DLP vendor that does forensic analysis on data loss events that occurred prior to creation of rule. Quickly identifies and classifies data that is important to each organization. Prioritizes the remediation of critical compliance information and highly sensitive data over less critical data. Location and application tagging allows you to get to faster data protection. No prior knowledge of the files details is required. McAfee Total Protection for DLP safeguards intellectual property and ensures compliance by protecting sensitive data wherever it lives—on the network, in storage systems, or at the endpoint, while saving time and money with centralized deployment, management, and reporting. It tightly integrates with other solutions in our data protection portfolio such as email security, web security, and encryption to provide the ultimate protection for data at rest, data in use, and data in motion. You can’t afford to wait months for your data protection solution to start to do its job. Every minute your data is unprotected is another minute that the reputation of your business and the safety of your customers’ information is at risk. Some solutions require lengthy and complex deployments that demand highly specialized skills to build, tweak, and tune. Heavy deployment costs can double the acquisition price and prolong risk that can wreak untold damage. McAfee Total Protection for DLP breaks this impasse. The solution is up and running as quickly as you can plug it in. Within a week, the system gathers a wealth of information about your data use, allowing you to start building effective policies that immediately deliver value. How Can You Protect What You Don’t Understand? Most DLP solutions can’t protect your data if you can’t accurately describe what your data looks like and where it is. Do you know where your data is today? How long would it take you to learn about it? Would you ever be able to keep up with the changesthat happen minute to minute to the data inside your organization? The truth is, no IT department can take on thistask single-handedly. McAfee Total Protection for DLP helps you easily understand the data that flows through your networks, giving you and your business stakeholders a real-world map of all your critical information assets, not just the ones you already know about. This provides you with the insight you need to build policies that protect your data today and into the future. The McAfee DLP Manager appliance is the central controller for the entire DLP solution and the integration point into enterprise-wide management and monitoring via the McAfee® ePolicy Orchestrator® (McAfee ePO™) server. The McAfee ePO server gives you a single view into your organization’s entire risk posture, and you can easily drill down to see specific security events and identify causes. It reduces the overall operational expenditure associated with managing and maintaining the solution by allowing you to quickly gain an overview of your data security status, distribute policies, and delegate administrative roles as needed. This makes it possible for multiple cross-functional stakeholders within the organization to collaborate on incident workflow and case management without any need for IT involvement. Create actionable oversight with a unified incident dashboard. Escalate incidents to any authorized individual through embedded case management. Implement flexible incident and case logic—multiple incidents can belong to a case or a single incident can belong to multiple cases. Expedite setup for key team members within the organization, including administrators, legal, human resources, compliance, operations, and information security. Define additional roles with a few mouse clicks. Integrate with Microsoft Active Directory for centralized authentication services. Understanding where sensitive data resides is the first step to securing it. The McAfee DLP Discover appliance simplifies the discovery with a simple three-step process—inventory, categorization, and remediation. Unlike other solutions that expect you to know exactly what content you want to protect and the locations where it’s likely to be stored, the McAfee DLP Discover appliance does the heavy lifting by rapidly categorizing large amounts of unclassified data, so that only relevant files are being examined and remediated. Inventory—Creates an inventory of assets across the organizations and performs analytics on the metadata only for speed. Categorization—Classifies content into buckets and performs analytics on the classified content. Remediation—Scans the classified data for policy violations, remediates, and registers information. With the new data classification capabilities in the McAfee DLP Discover appliance, you now have a scalable and rapid way to classify your data, scan your data, and automate remediation tasks. The McAfee DLP Prevent appliance enforces policiesfor information leaving the network through email, webmail, instant messaging (IM), wikis, blogs, portals, and Web 2.0 technologies. Ensure the security of the information you know you must protect—Social Security numbers, credit card numbers, and financial data—and the information you want to protect, such as highly valuable intellectual property. The McAfee DLP Prevent appliance allows you to take a variety of remediation actions, including encrypting, redirecting, quarantining, and even blocking—so you can ensure compliance with regulations governing the privacy of sensitive information and reduce the data risk to your business. Enforces policies for information leaving the network through email, webmail, IM, wikis, blogs, portals, HTTP/HTTPS, and FTP transfers. Integrates with email gateways is done via SMTP while web traffic is inspected using the Internet content adaptation protocol (ICAP). Scan and analyze information in real time—Integrated into the network using a switched port analyzer (SPAN) or tap port, the McAfee DLP Monitor appliance performs real-time scanning and analysis of network traffic at line speeds. Discover unknown risks—Through detailed classification, indexing, and storage of all network traffic, not just information that matches existing rules, the McAfee DLP Monitor appliance allows you to quickly build a deep understanding of where data is, how it is being used, who is using it, and where it is going, helping you anticipate new risks as the environment changes. Deployed through the McAfee ePO management platform agent, McAfee DLP Endpoint software lets you instantly monitor and prevent confidential data loss at work, at home, in the cloud, and on the road. McAfee DLP Endpoint protects your organization from the risks of financial loss, brand damage, lost customers, competitive disadvantage, and regulatory noncompliance. With McAfee DLP Endpoint, you can quickly and easily monitor real-time events, apply centrally managed security policies to control how employees use and transfer sensitive data, and generate detailed forensics reports with minimal impact to your daily business activities. Prevent data loss and leakage when data is modified, copied, pasted, printed, or transmitted while enabling its flexible use. Comprehensive incident reporting and monitoring gathers all needed data, such as sender, recipient, time stamp, and network evidence, for proper analysis, investigation and audit, remediation, and risk assessment. Crawling of sensitive data at rest on local hard drives with granular targeting by user and network group. Enhanced virtualized support allows for flexible per-user policies for better control of the data flowing to shared terminals. Control and blockage of confidential data copied to USB devices, flash drives, iPods, and other removable storage devices, including optical media and hard copy. Integration of DLP and digital rights management (DRM) extends protection beyond your network. 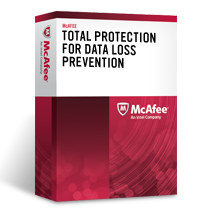 Download the McAfee Total Protection for Data Loss Prevention Datasheet (PDF). For more than 5,000 nodes, please use our Quote Request Form!